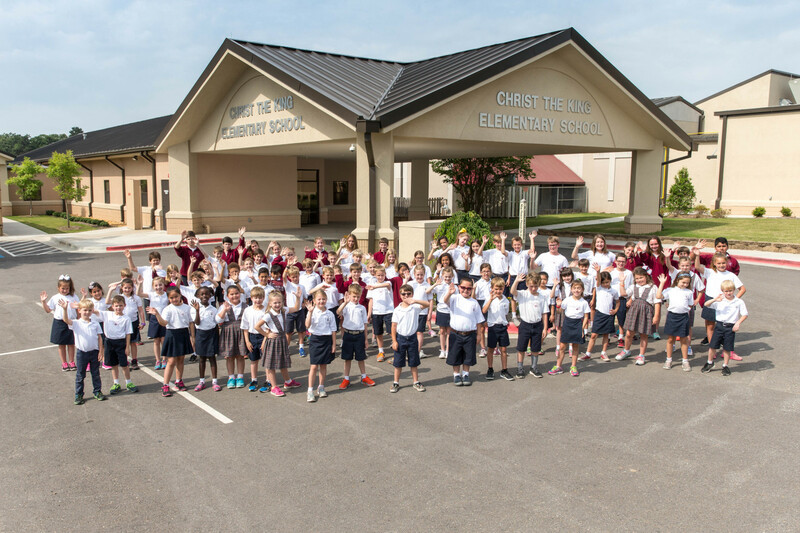 Christ the King School will follow diocesan and Arkansas state requirements regarding basic materials, specific courses, and time allotments. A planned instructional program will lead to discovering and developing the abilities of each student. Christ the King School will offer a balanced curriculum including religion, language arts (English, reading, literature, oral and written communication, speech arts, handwriting, spelling, usage, and grammar), science, mathematics, social studies, (history, geography, civics, economics and sociology), art music, health, physical education, Catholic Family Life, and such electives as deemed practical and helpful. For more information on Christ the King Catholic School's Curriculum click here. Grades are determined by a combination of daily work and test scores. Therefore, it is imperative that students do the assignments and take the tests. Credit cannot be given to a student who has not performed. It is the responsibility of a student to ask for any make-up work incurred by absence. Upon returning to school from an absence, a student must approach his/her teacher and ask for tests and assignments to be made up. A grade of zero will given for a test or assignment not completed. Pupil progress is reported to all parents four times each year. During the fifth week of each nine weeks’ reporting period Interim Reports will to be sent home with students in grades 2-8. Progress reports (when needed) will be sent home with students in Kindergarten and 1st grade. Specific cut-off and send home dates are listed in the school calendar. Parents can monitor student progress through RenWeb. Report cards are distributed at the end of each quarter (nine-week periods). When failure seems inevitable, parents shall be properly notified in advance. All report cards require the signature of the parents before they are returned to the teacher. Parents should be aware of the times when report cards are distributed. The school calendar lists the end of each quarter. Report cards are distributed within a week after the quarter ends. 4.12.2 Modified Grading A modified grading scale may be used in academic areas affected by the student’s diagnosed learning disability or other diagnosed handicapping condition. On the permanent report card, an asterisk will be placed beside the modified subject area. The description of the subject modification(s) will be placed in the student’s file. Letter grades given in the modified area(s) will be based on the academic performance as defined in the student’s modified academic plan. 4.12.3 Diagnosed Disability A diagnosed disability is a condition that has been evaluated by a psychiatrist, psychologist, psychological examiner, or physician and determined as severe enough to prevent a child from learning through traditional classroom instruction. Copies of test results and suggestions for educational modifications and/or an academic plan must be filed in the school office. Promotion will be based on the passing mark of seventy percent (70%) or parent/teacher consensus. Two failures (other than failure in the Fine Arts, computer, Spanish, or Health and Physical Education) constitute a grade failure unless they are made up during summer classes approved by the principal. Proof of attendance at summer school and passing marks will be presented to the principal before the child is permitted promotion. A permanent record will be kept for each student. The permanent record will include the attendance, cumulative academic grades, and results from the annual standardized test for the student. Subjects in the curriculum are: Religion, Mathematics, Language Arts (Reading, English, Spelling, Penmanship), Science, Social Studies (History, Geography), Fine Arts (Music, Art), Health and Physical Education. Realizing that homework does not solely consist in written work, but that both written and study work are important. Home study time varies according to the needs of the individual child. Children will not be permitted to call home for forgotten assignments. Records: individual inventory of physical and mental growth. Testing: Achievement test are administered to students in grades 1-8 at the time designated by the Diocesan School Office. Parent-Teacher conferences are held the first semester of the school year. Additional conferences for individuals may be arranged if the teacher or parent indicate this need. The Parent - Teacher conference can be an invaluable help to both parents and teachers. The student’s life is continuous, and unless both home and school unite in a close partnership to make his/her growth continuous, the student is heavily penalized and suffers accordingly. Learning situations should not be such that one kind of growth exists at school and an entirely different kind of growth at home. Parents are also urged to compare the child’s achievement with previous records, rather than with the attainment of others, and to consider achievement in terms of ability. Informal guidance in classroom, on playground, etc. If a teacher plans a field trip for a class, a note will be sent home to the parents. The parents must sign this note giving permission to participate in the field trip. The teacher reserves the right to deny a student field trip permission. The parents are asked to help with transportation. Parents who drive must also send in their own child’s permission slip. Field Trip documents will be accessible on RenWeb. Field Trips for K-6th Grade will depart from and return to the Main School Entrance. Field Trips for 7th Grade will depart from and return to the Junior High Entrance. Field trips for 8th Grade will depart from and return to the Gym Entrance. All field trips must be within Pulaski County. The principal, in consultation with pastor, can allow exceptions to this policy. Drivers must have completed all CMG requirements, including training, background check and certification on CMGConnect. Drivers must have liability insurance in the amount consistent with the laws of the State of Arkansas and complete the required Diocesan forms prior to the field trip. Each child must wear a seatbelt while being transported to and from the field trip destination. It is the responsibility of the parent providing the transportation to make sure each child is buckled up. Teachers shall advise each parent as to their responsibility. PARENTS SHOULD PROVIDE TRANSPORTATION TO AND FROM THE SITE OF THE FIELD TRIP ONLY. SPECIAL TREATS OR SIDE TRIPS FOR SNACKS ARE NOT PERMITTED. If a book is lost or destroyed, the student will be responsible for the replacement cost. All records will be held until the matter is resolved. To promote and recognize Christian values and moral behavior, a stated goal of Christ the King School, only movies with a MPAA rating of “G” (General Audiences) will be allowed to be viewed at the school. Seventh and Eighth grade students will also be allowed to view movies rated “PG” (Parental Guidance Suggested) if the teacher has previewed the movie prior to showing it to his/her class, and has received prior approval from the principal. “PG - 13” movies are not permitted.